Signature is unique to the person like fingerprint, DNA or handwriting. It cannot be exactly same as handwriting. So there would always be some natural variation associated with the handwriting and signature. A signature is a symbolic representation of consent to agree to the document signed. We agree to the circumstances provided in that cheque, agreement, contract or any other document. In certain cases, the thumb impression as that in case of deceased or unconscious person can easily be taken. A signature has most of the features of one’s handwriting. It is an extension of handwriting. It is sometimes personalized and is not even legible. It can be said to have formations and not alphabets. DNA Forensics Laboratory Pvt. Ltd. has experts to even identify these formations. They can declare the signature as genuine or fraudulent. We can help you to check and prove Authenticity of signatures and to detect and analyses forgery in signatures. Forgery is a crime. The signature may be valid but the manner in which it has been acquired may be fraudulent. This can be said as fraud not forgery. Although DNA Forensics Laboratory Pvt. Ltd. team uses the latest and most sophisticated methods of signature verification, some general tools that are used are observatory. The forger may start or stop bluntly or with undue emphasis. These small details may not be visible to a layman. Normally, a signature starts and stops dynamically. This leaves tapered look at the beginning and ending. The hesitation in the mind of the writer can easily be detected. The pen moves slowly and in some cases microscopic tremors can be detected. In case of a fraud signature, the accused may even try to rewrite and fix up some mistake. DNA Forensics Laboratory Pvt. 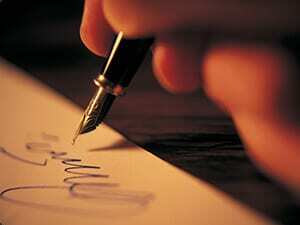 Ltd. can differentiate between the signatures of an aged writer since they also show similar traits. Auto forgery cases can also be solved where the person denies his own signature. Usually in this case the writer writes someone else’s name. Usually it is not an attempt to copy the signature and any resemblance is co-incidental. The writer usually constructs these signatures by practice and skill. They may be similar to the genuine signatures. The model signature is memorized and even some movements are practiced to produce it.